The Aldo Leopold Nature Center naturalists, staff, and interns can now recycle more items than ever before – saving them from ending up in the landfill. Thanks to a partnership with Winnequah Elementary School’s TerraCycle program, items that are not typically recyclable, such as foil chip bags, juice pouches, cereal bags, pens and markers, will be collected at the ALNC before being picked up by Winnequah volunteers. The items are then sorted and shipped free of charge to TerraCycle to be repurposed or upcycled. In addition to keeping waste out of the landfill, Winnequah Elementary’s recycling efforts also earn them a small amount of money from TerraCycle. Sustainability and stewardship of the land are serious business at the ALNC. 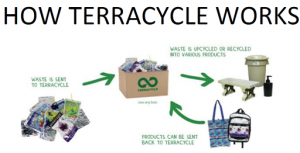 Extending recycling options by joining the TerraCycle program is one of the latest examples of this ongoing commitment. Recognized as 2014 Sustain Dane MPower Business Champions and InBusiness Magazine 2014 Sustainable Small Business of the Year, the Aldo Leopold Nature Center continues to integrate more and more ways of sustainable living. While the TerraCycle collection at ALNC is currently only for naturalists, staff, interns, and our summer camp program attendees, there are several collection points in Monona that are open to the public: the Monona Public Library, City Hall (Employee break room), and Cousin’s Subs. – Bags from potato chips, pretzels, tortilla chips, cheese snacks. Any size. – Entenmann’s Brand Little Bites® pouches. – Aluminum and plastic juice/drink pouches (No juice boxes). – Plastic pouches, caps from squeezable fruit/veggie snacks (ex: Go-Go Squeez). – Plastic pens, mechanical pencils, markers, highlighters, and caps. – Toothpaste tubes, caps, brushes, dental floss cases. – Cosmetics, hair care, and skin care packaging. – Brita® and PUR® brand water filter systems, bottles, dispensers. – Plastic bulk cereal bags, plastic cereal box liners. (No cereal boxes). – Baby care packaging – soft plastic outer wrap from diapers, wipes.